A man named Walter Schnitder drew Dr Robert C. Beck'sattention to the above-mentioned item in Science News. Beck looked up the patent and decided to try and duplicate the therapy, but he wanted to do it non-invasively; that is by applying the electric current from outside the body. Now if you apply a direct current (DC) potential to the skin, you're going to get an electrolysis effect and that can cause problems, so Beck designed a circuit that varied the voltage with an alternating current (AC) at a very low frequency and avoided the electrolysis problem. The waveform that Beck chose is not the typical sine wave seen in AC household outlets, but rather is a bi-phasic square wave, meaning that the waveform voltage has a positive half and a negative half, allowing the current to reverse direction each half cycle. Square waves generate a large number of harmonics. Harmonics are frequency multiples of the original frequency. Odd harmonics are mutiples of the original frequency multiplied by 3, 5, 7 etc. and even harmonics are multibles of 2. For example, the odd harmonics of a 4 Hertz (Hz) square wave would be 12 Hz , 20 Hz, 28 Hz, etc. right up into the radio frequency range. Georges Lakhovsky, Nikola Tesla and many other scientists had discovered that everything in Nature has its own resonant frequency including every bacteria, virus, parasite, and fungus on the planet. Dr. Royal Rife was able to cure terminal, end stage cancers in the 1930's by applying the specific resonant frequencies of certain unique bacteria that are always assocaited with all types of cancers. The steady application of the bacteria's resonant frequency by plasma wave radiation caused the bacteria to internally shatter and eviscerate, thus destroying it (and all the other bacteria within the body that possessed the same resonant frequency) . While Kaali and Lyman used DC current to deactivate the AIDS virus, Beck found that he could get the same results using the 3.92HZ square wave. Kaali and Lyman found that the amount of the current applied was the critcal factor and if they kept the current within a range of 50-100 micro amperes- they were able to disable the HIV virus within a petri dish as mentioned above. Kaali then worked out a design of a small battery with two tiny electrodes that could be sewn directly into an artery in the arm or leg. By maintaining the current flow between the two electrodes within the 50-100 micro ampere range, the HIV particles were gradually disabled within the bloodstream and the AIDS victim would gradually recover his health. The procedure required surgery that costs about $5,000 (at that time). The implanted electrodes would cause scarring of the artery walls, so they had to be removed and implanted in a new section of an artery every month or so, costing another $5,000 each time the procedure was done. It took about 6 or 7 months to see a substantial improvement in the AIDS patient. Bob Beck has been giving talks for many, many years on a variety of topics from Tesla to psychotronics. I first heard him in 1994 on an after-midnight radio show out of Los Angeles called "Something's Happening" with Roy of Hollywood ( KPFK, 90.7 FM). Bob was getting ready to give a talk at the Pasadena Health Expo that upcoming weekend and proceeded to explain to Roy what he had discovered with blood electrification. I was amazed and blown away by what he told Roy. I had to learn more, so I made it my business to be at that convention and attend Bob's talk. Learn more about Dr Bob Beck's discovery of blood electrification and other Beck protocols directly from Bob Beck himself by watching any of the three Beck videos available on the Videos page. 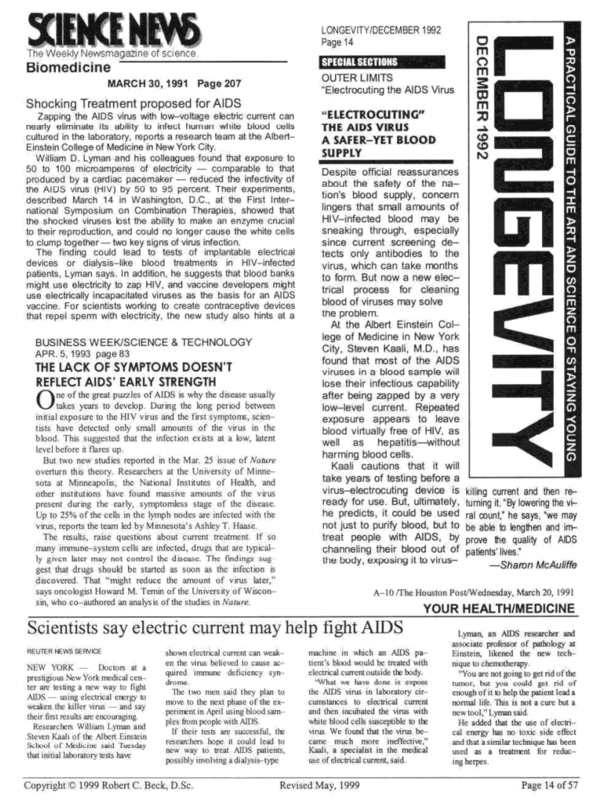 You can also read more information about blood electrification from this article printed in Nexus magazine in 1998.